As you may have noticed Phil and I have been battling over Sector Munitorum terrain over the last few games. 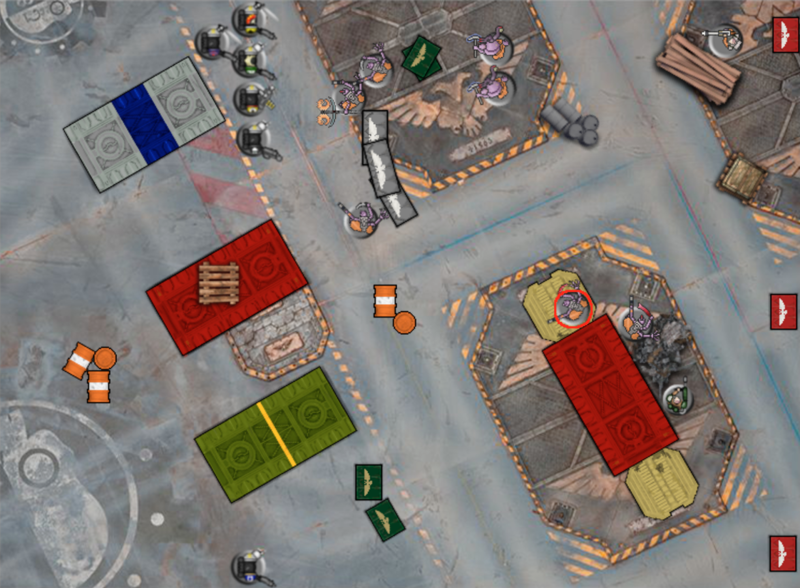 The idea is that this is a desperate battle for the Endless Salvation, which is the largest orbital space dock in the Syrlene system (Phil and I have a 40k campaign set on Syrlene IX… I still need to write up the last game from that campaign!). The way we’re running our campaign is the the player who lost the previous battle gets to choose the mission (and be the attacker) in the next one. That way you have some control over which of your opponent’s campaign resources you’re attacking. For example, I lost the last game and opted for Disrupt Supply Lines as if I won Phil would lose 2 Materiel, which was a resource he was hurting in already. It resulted in a somewhat one-sided game… Phil rolled pretty well for his Cult Ambush and combined with winning initiative it allowed three acolytes got into my Deathwatch before they’d even moved! Here’s where things went poorly for Phil as they bounced off of my guys. He (wisely) decided not to charge the guy Frag Cannon guy, but again that weapon proved very (overly!) powerful. Phil focussed the Mining Laser on him, but the Neophytes must do target practice training with Storm Troopers! Once Phil’s team broke and my Frag Cannon had punched through to the objectives it was game over and Phil decided to withdraw. I thought I was really up against it when I chose this mission, but it panned out okay. My armour held and my aim (and to wound rolls) was true.